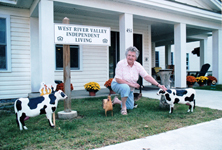 West River Valley Independent Living is apartment-style housing for seniors age 62 and older who can live independently but want a hassle-free lifestyle without the worries of home maintenance and up-keep. This housing provides affordable, energy-efficient apartments with full kitchens and baths. Laundry facilities and common room space is available on each floor. Supportive services like meals and house cleaning are also available on a fee-for-service basis. One and Two-bedroom apartments available. See the unit layout here! If you have questions about the application process, please call Jen Gagliardi, our Property Manager, at 802-365-4115. Learn more about our Assisted Living Housing or Supportive Housing options.